While reviewing the note about the author on Amazon, I knew that what I would be reading would be an unusual take on a murder mystery. 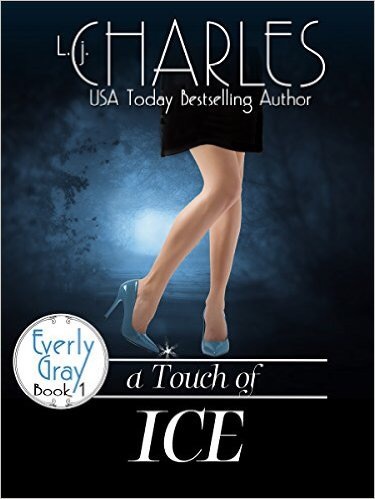 The author, L. J. Charles, is a past yoga instructor, who, when deciding to write full time was driven to the paranormal genre because she wanted to include her life experiences with energy into her stories. This might raise question marks to the average reader, but as the daughter of a woman who left her career as an Interior Designer, moved to North Carolina to become a hypnotherapist who practices Reiki and meditates with her Chakra bowls, I felt like whether the book was good or not, this was a perspective I could understand. I purchased the book and read the first line and my interest was piqued. Everly Gray is introduced to us as a Personal Coach who uses her gift as a touch sensitive to help people discover their emotions. Those of you who are familiar with the Eileen Wilkes series The World of the Lupi (see my previous post This Chick Read: Mind Magic) are familiar with Lily Yu, who is also a touch sensitive, though in her case she can tell if magic was used in a crime, just by touch. Everly’s energy is of a more practical, real world nature. She receives emotions and images when she touches things with her fingers. Can you imagine how awkward life could be if you shake someone’s hand and can see something they’ve done or feel? Because of this difficulty, Everly has kept herself pretty secluded, only a couple friends and relationships few and far between. The following plot is taken from Amazon.com. When she touches photographer Mitchell Hunt and sees the image of a dead body, she dives into the murder fingertips first. Life takes a turn for the dangerous when she discovers the body is related to a small-time crime family that accidentally stepped on the toes of notorious criminal, Delano West. Caught in a web of intrigue where nothing is as it seems, El discovers an aptitude for breaking and entering, the pain of an up close and personal meeting with a bullet, and the terror of facing a cold blooded killer. What she doesn’t learn—to keep her fingers to herself. Everly’s character develops from life coach to “seeing” a dead body and solving crimes pretty quickly, and the reader is launched into a plot that was well developed and fun to read. I believe this is one of L.J. Charles first novels, if not the first and you can tell that she gained confidence in her writing as the story unfolded. Some of the conversations seemed awkward at first, and if she had used more descriptive language to describe the things that Everly was “seeing” it may have had greater impact. By the end of the book I wasn’t thinking about those things, I was thoroughly enmeshed in the story that was unfolding. Especially of Mitch and Pierce, their descriptions were very nice indeed! There are seven books in this series and I have a feeling there could be a love triangle thrown into a storyline at some point. There was a lot of sizzle between Everly and the two men in this one! If you like Paranormal Romance Mysteries that have a psychic twist, then check out this series! It’s fun to discover a new writer who has written a ton of novels because you don’t have to wait for the next one to come out. Buy this book on Barnes and Noble!